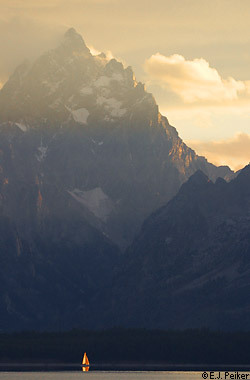 give you an idea of why the Tetons are so majestic and awe-inspiring. And why the word magnificent is used so much to describe them. 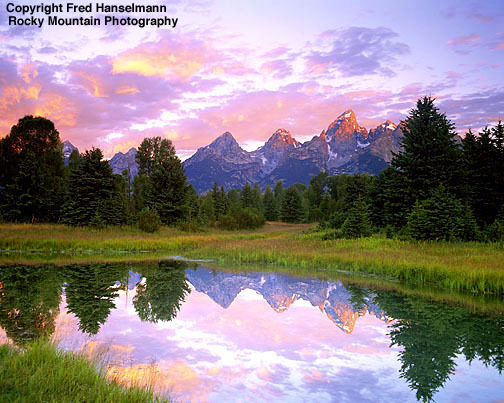 Unlike most mountain ranges, which have foothills, the 40 mile long, 7 to 9 mile wide Grand Teton range is fronted by vast expanses of land then the mountains abruptly rise 3,000 to more than 7,000 feet above the 6,500 to 6,800 feet elevation plain. They are rugged and craggy with some snow and over a dozen glaciers and perennial ice fields on top year ’round. There are eight peaks over 12,000 feet in elevation. 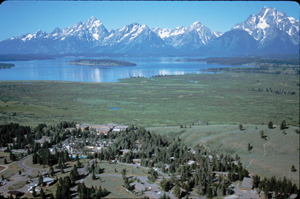 The highest peaks are: Grand Teton (13,770 feet), Mount Owen (12,928 feet), Middle Teton (12,804 feet) and Mount Moran, at the center of the photo below, (12,605 or 12,594 feet, depending on the source). For a close-to-home comparison, De Anza College sits at 274 feet elevation. Montebello Ridge above us is at 1,800 to 2,400 feet. Castle Rock Ridge above Saratoga runs at about 2,800 to 2,500 feet with Summit Rock and Castle Rock at 3,076 and 3,214 feet above sea level. mid-sized lakes like Jenny Lake, (2 miles by 1 1/4 mile, 226 feet deep), or massive lakes like Jackson Lake, almost 14 miles long, 445 feet deep. Along the base of the range there are 7 moranial lakes. Among the peaks and canyons there are over 100 alpine and backcountry lakes and a dozen glaciers to keep some of them quite cold. 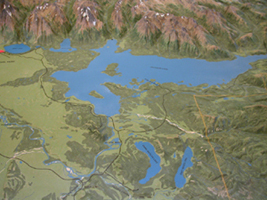 Below, a photo of a visitor center raised relief map. Jackson lake is the biggest one, with Jenny Lake and Leigh Lake to the upper left of it. At the bottom are Two Ocean and Emma Matilda lakes. Participants can stay for a shorter, longer or much longer trip. 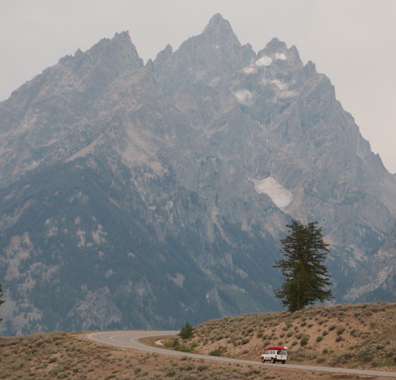 Often people go to Yellowstone National Park, just north of Grand Teton, as well. Some couples/groups have visited many states/parks on the way to or from the trip. Baby bears seen on the 2018 trip. How long you stay (a long weekend, a couple of weeks or often in the past people have made the drive home into some variation of a nine-national-parks-plus-Las Vegas-or-Seattle-in-six-days-road trip. etc. is/are up to individuals on the trip, but each of these is usually coordinated somewhat with most of the group staying at the same place (Colter Bay) and a few meals, or some years, most meals, taken as a small or large group at a restaurant or as a cookout / picnic. We will have three, four, or … official kayaking or canoeing mornings/days suitable for beginners. If it turns out we can’t transport the kayaks your trip fee will not cover rentals for that many days. (Weather could cancel some kayaking as we do not risk kayaking during thunderstorms.) Kayaking will probably start with a brief outing on Colter Bay, just down the road from the campsites/cabins. This is flat water with little current and is a good way for people with no kayaking experience (such as our usually May and October Monterey trip) to get a first experience. We also plan sunrise kayaking on Oxbow Bend and on another day, a five mile stretch of the Snake River from Jackson Lake Dam / Cattleman’s Bridge could come next. 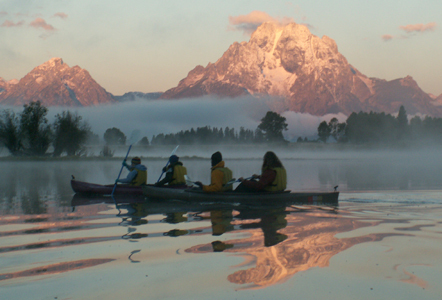 See Grand Tetons trip kayaking. We plan to do a short to quite long (your choice of distance, with or without a Ranger Naturalist), hike into Cascade Canyon. Cascade Canyon, Grand Teton National Park Your trip fee includes one ride on the hiker shuttle boat across Jenny Lake for the all day Cascade Canyon hike on a day picked by the group. ($15 per adult in 2018). (The boat shuttle takes four miles off the round trip hike, allowing people to hike farther into the mountains.) Day to be chosen once we are in the park. People can choose other hikes, with or without a Ranger Naturalist, to the many canyons and lakes. People usually do some or a lot of sightseeing. We know the best places to look for elk early in the morning and where a pair of bald eagles usually nest (and when we bring people to these locations we make certain they don’t disturb the animals). Stargazing is so much better than in the city and the Milky Way is in full view on the mostly uncloudy nights. Or we occasionally enjoy a full blast thunder/lightning storm (or maybe a little snow). 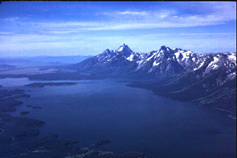 Below, a photo of Jenny Lake, Leigh Lake and part of Jackson Lake. Our overnight wilderness campsite is usually on the left hand side of the lake in the middle, Leigh Lake. Many people on the trip work towards getting their park Young Naturalist or Junior Ranger certification and go to Ranger programs together. or earn a Junior Blue Goose Ranger badge at the National Elk Refuge (Forest Service) Visitor Center in town. and in 2005 on a deck boat on Jackson Lake. 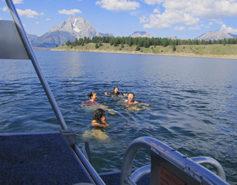 In the picture below the girls jumped off the deck boat into Jackson Lake and swam, and encouraged the guys to join them (but they didn’t). If we do this year it will be subject to availability, date and time to be decided when we know who/when is going and what budget they have. 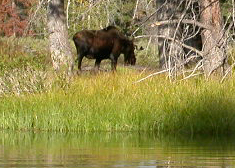 Even on a short trip you can expect to see elk and bison, (often moose) especially if you are out early. Fall trips have more chances to see animals than in the summer. The moose calves will be about 2 1/2 months old, the elk calves about 3 to 3 1/2 months old and the cows (mothers) will not be hiding them as much. It will be the start of elk mating season and the bulls will be bugling and gathering harems. If you are lucky and spend enough time in the park you may see Bald Eagles, otters, beavers, grizzlies and see or at least hear coyotes and wolves. More details about flora and fauna are below. The club has gone in August/September 2000, 2002, 2004, 2005, 2006, 2007, 2008, 2009, 2010, 2011, 2012, 2013, 2014, 2015, 2016, 2017, 2018 and June 2003. De Anza owns ten tandem (two-person) kayaks. These are not the kind of kayaks with spray skirts that your legs are stuck in, they are more like small canoes. The total number of people who can sign up for this trip and expect to kayak regularly is 20 unless we take turns or rent extra boats. Oxbow Bend and launching shortly after, often paddling into the mist. We spend so much time out watching ducks, birds and animals we usually miss the last of breakfast seatings at the fancy buffet at Jackson Lake Lodge (until 9:30) and end up eating at the Colter Bay Ranch House, or missing breakfast altogether. Then we finally get a shower and sometimes a nap to make up for lack of sleep the night before, or we start on mid-day activities. If you want to go kayaking or canoeing with us on this trip you MUST read Grand Tetons kayaking . The page has lots of pictures of the animals we have seen. 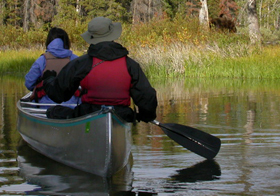 it’s Ranger walks, museums, hikes (we will skip the early morning kayaking on the day of the all day Cascade Canyon hike Cascade Canyon, Grand Teton National Park), other driving and/or kayak tours. Trip cost includes part of the cost of the bear spray, which is required for everyone to carry. Each trip member is required to attend a ranger program on safe bear spray use and watch an online video and read about bear spray before they go hiking, biking, kayaking or even walking away from developed areas. 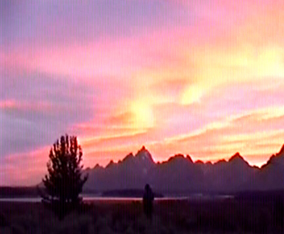 The ranger programs are offered every day at at least one Grand Teton National Park visitor center. (The material to read is at: https://www.nps.gov/yell/learn/nature/bearreact.htm and https://www.nps.gov/yell/learn/nature/bearspray.htm and the Yellowstone bear spray video is linked to at that page.) In a dozen years of club trips no one has had to use (spray) any bear spray. We usually plan to bring trail snacks/picnic food rather than take the time to go to restaurants for lunch, but the burgers at the take-out window at Jackson Lake Lodge sometimes call to people. Each year people have planned time to make a half day or longer caravan trip around the main park loop road for general sightseeing. Pictures and info about visitor centers, Cunningham Cabin, Menor’s Ferry, Chapel of the Transfiguration, Cascade Canyon, Signal Mountain summit road, Colter Bay Indian Arts Museum, and Morman Row are at: Grand Tetons sightseeing The page has a link to details about Cascade Canyon, our intended all day hike, the date of which will be chosen when we know who is coming and when. Riders must weight no more than 225 pounds and must wear closed toed shoes (long pants recommended). No backpacks, video cameras or binoculars allowed by most outfitters. Recommend you apply sunscreen and insect repellent PRIOR to the ride. Suggest you carefully read all their rules in advance. Experienced surfers could bring their surfboard, when we go in early summer, there are sections of the Snake River (from West Table to Sheep Gulch, especially Taco Hole and Lunch Counter, or search for King’s Wave just north of Astoria) you can surf in place on a rapid for as long as your legs hold out (or until a raft needs to go through or someone else wants to take a turn). Some really are only for experienced surfers, (some of whom will tell you they thought they were going to drown the first time they tried it in early season), and the wash out below the rapids can have serious rapids/large boulders as well. 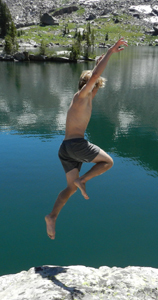 Much of the surf potential depends on how much water the Bureau of Reclamation releases from Jackson Lake Dam, and the best ‘season’ for this surfing is early summer, sometimes into July. You know without asking this is not a college-sponsored event. In 2010 some of the group went to an outdoor concert with Willie Nelson. Most years, free concerts are offered every Sunday at 5 p.m. at Teton Village. the climbing gym in town was a tempting place to spend a rainy day and we hope one can reopen. 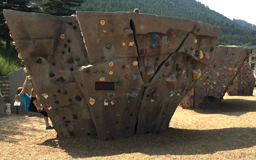 In the meanwhile Phil Baux Park, at 10 E Snow King and S Cache, Jackson, Wyoming (at the base of Snow King Mountain) has artificial climbing boulders, (is one of them still the world’s largest artificial boulder? 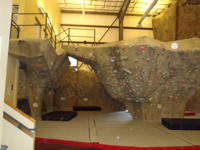 ), open to the public for free (except when booked by a group) with built-in hand/foot holds.The main adult sized is 30 feet long at the base and 40 feet wide at the 12 foot high top. Another is kid sized. The park foam footprint was made of preconsumer recycled material. You know without asking that climbing is not a college-sponsored event. Grand Tetons biking has rules, advice and suggested routes in and out of the park for mountain and road bikes. It includes warnings and statistics about cyclist (or trail runners) encounters with grizzly bears. Get your fishing license at the Wyoming State Information Center as you drive through Jackson Hole, Wyoming on the way to the park. Most meals on these trips have been picnic or cookouts, but on each trip most people have eaten out at least a breakfast (or two or even three of the most fabulous brunch), and sometimes a dinner. Restaurants in Grand Teton National Park are non-smoking, many others in Wyoming and Montana allow smoking. There are dozens of restaurants in the town of Jackson. They vary from burgers, Chinese, Mexican, sushi, pasta, Italian, steakhouse to four-stars with “an award-winning wine list”. Most lean towards family or casual atmosphere. 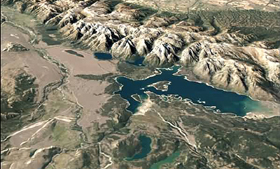 The photo below shows only part of Jackson Lake. The main Jackson Lake Lodge building is the tan rectangle at the top of the section of forest at the bottom of the picture, with the hotel cottages, parking lots and swimming pools below it. Lunch Tree Hill rises to the right just above the forested area. We’ve watched most sunsets (occasionally with thunderstorms and rainbows) from Lunch Tree Hill. When we have sunset dinners there we’ve had the top of Lunch Tree Hill almost to ourselves, most of the tourists being crowded on the back deck of the lodge. Pilgrim Creek, Third Creek and Second Creek flow through the broad expanse of Willow Flats, (the center third of the photo) an extensive freshwater marsh with streams dammed by beavers. (The flats are a major elk caving ground, closed to people “from May 15 to July 15 or when posted.” We’ve always seen elk and moose with our binoculars and telephotos. 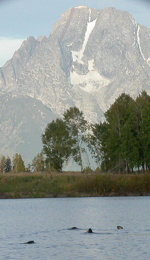 Mount Moran is the peak to the right. It’s not the highest peak, it just looks like it in this picture. Colter Bay, where most of us have stayed previously on this trip, is just out of the photo to the right. NPS photo below of a fiery Teton sunset on Jackson Lake by Jackie Skaggs, who said the 1976 sunset lasted almost 30 minutes at this intensity. 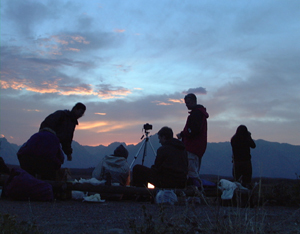 For the 2018 trip (mountain daylight time) civil twilight will begin at about 5:56 to 6:14 each morning, with sunrise from 6:27 to 6:44. Sunset will be between 8:28 and 8:03. Moonrise and set is different each day. (Note that the following times vary according to the height of mountains the sun rises and the moon sets over the peaks of.) On Sunday, August 26, 2018 there will be a full moon. Sunrise will be at 6:40 a.m. and the full moon will set at 6:41 a.m. This means that, depending on the weather, you might be able to get a photo of the full moon next to mountains colored by the sunrise. 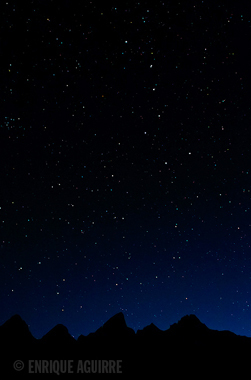 “At night the stars shine like crystal rivets in the blue-black sky”. Yellowstone National Park, with Old Faithful Geyser, is just north of Grand Teton National Park. http://www.ynp-lodges.com/ Campgrounds usually do not all fill during the fall season. Most previous trip members have at least done a one or two day sightseeing drive into Yellowstone. 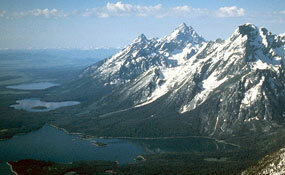 The south border of Yellowstone is only 8 miles from the north border of Grand Teton. It’s 56 miles from Colter Bay to Old Faithful. Old Faithful erupts on the average every 60 to 110 minutes, for 1 1/2 to 5 minutes, with an average height of 130 feet. See https://www.nps.gov/yell/learn/nature/oldfaithfulgeyserfaq.htm for an app of the next eruption prediction. “The famous geyser currently erupts around 17 times a day and can be predicted with a 90 percent confidence rate within a 10 minute variation.” Our favorite memory of an Old Faithful eruption was at night with light from a full moon and lightning from a thunderstorm in the background. I put lots of links to Yellowstone info at Yellowstone , including a link to a mini-video of an elk redoing the paint job on a Cadillac that you should watch. In summer many Grand Teton elk migrate into Yellowstone, the biggest free-ranging herds of bison are in Yellowstone and the most wolves. Below NPS map from 2010 of wolf pack territories, compare to 2017 further below. See a larger copy of the entire state of Wyoming map with wolf packs on page ten of the 2017 report. October 2017 “the bison population in Yellowstone National Park measured around 4,800 head, down from the estimated 5,500 bison present in Yellowstone around this time in 2016.” A July 2012 report said “almost between 2000-4000 bison live in Yellowstone National Park, and almost 1000 bison reside in Grand Teton National Park.” 1,000 bison were counted in the Teton winter range in 2007, 840 in the winter range 2012. Yellowstone 2009 late winter estimate of 96-98 wolves, 3,000 bison, 6,000+ elk. August 2012 saw a Yellowstone bison estimation of 4,230 including 600 calves born that year. In 2004, 719 bison in the Jackson herd, over 4,000 in Yellowstone. to see if the water really is that hot. Please don’t be tempted to swim in hot springs. Thermal waters can harbor organisms that can cause fatal meningitis or Legionnaire’s. Backpacking will not be an official part of this trip, but you could get a permit for a backpack adventure if you plan ahead and bring appropriate gear. A few details about permits, etc. are at Grand Tetons backpacking. The advice above for climbs to 10,000 or even 13,000 plus feet also applies to our stay. We are mostly staying at 6,800 feet elevation. On hikes we can go much higher (up to 9,000 feet in Cascade Canyon). You will probably feel out of breath at first and may even get a headache and lose appetite. You can get more sunburned. Read At altitude for advice. It includes why your tent mate might seem to stop breathing. for details, including (September 5-16, 2018) historic ranch tours, cowboy jubilee concert, at least one galleries walk and the Taste of the Tetons sampling from valley chefs, restaurants and caterers, (and a juried art fair as well), in the town square as well as a Western Design Conference exhibition and sale of handcrafted works. The galleries walk(s), has various studios offering not only displays but also demonstrations. The gallery walks are free and have much more to see (including oil and watercolor paintings, prints, glass vessels, outdoor sculptures, furniture, pottery, quilting, jewelry, rugs) than the local (fee) museum our group was disappointed with on the 2007 trip. Old Bill’s Fun Run (fundraiser for local charities, including the Red Cross, Fire/EMS, Grand Teton Park Foundation and the Murie Center) is held the second Saturday in September. http://www.cfjacksonhole.org/old-bills-fun-run/ People from our trip volunteered at it for four years. Jackson Hole, Wyoming has a description of the main streets and how to find the Albertson’s, K Mart, Ace hardware, Teton County library, St John’s Medical Center, skate park, city parks with sand volleyball and/or tennis courts, artificial climbing boulders and more. Where will we stay overnight or camp? Where people stay is up to each person. It can be difficult to coordinate timing of activities if we don’t all stay in the same area, so we’ve all stayed at Colter Bay for at least part of the time on previous trips. Cabins and campsites are available at Colter Bay within walking distance of each other and walking distance to a restaurant, small store, the lakeshore, visitor center, art museum, laundromat/showers. If you will be staying in a Colter Bay cabin, go directly to Colter Bay cabins, Grand Teton National Park for details about the cabins and the logistics of sharing one. If you want to get a better room, or even a suite with fabulous view, fireplace, fridge, etc, read more at: Grand Tetons hotels, cabins, lodging. For our fall trips, no reservations for campsites are needed unless you want a motorhome hookup site. We know the best campsites to ask for at Colter Bay. At Colter Bay there is a picnic area with tables, firepits and restrooms at lakeside just down the road from the cabins and campground, hang a right at the Visitor Center parking lot. Look for the black and white aerial photo at: Colter Bay, Grand Teton National Park to find the picnic area, cabins, Visitor Center, grocery, campground, where you can find free WyFi, etc. (If we can use the college trailer and it’s not full, we can probably bring some camping gear for a few people along with the kayaks. The first aspen will be turning yellow, enough for some great pictures, with other shrubs and trees turning yellow, gold, red or orange. The peak fall color will be later than when we are there, but most of us can’t miss the first week of classes. (The amount and timing of fall colors depends on the weather. In 2009 there never really was much color.) Last of or the start of the crop of lots of kinds of ripe berries for birds and animals. There will still be some wildflowers. The Lady’s thumb knotweed (an aquatic plant) will be blooming on the edges of some waterways giving the impression, in the early morning low angled light, of a pink mist floating on the water. Probable sightings of bison, a shaggy, dark brown cow-like mammal, (10 to 12 foot long, 5-6 feet at the shoulder), (larger herds in Yellowstone: summer 2008 estimate of 3,000 in Yellowstone, summer 2009 3,300, winter 2009 2,900); elk (5 feet tall, 9 feet long), moose (7 feet tall, 9 feet long with 5 feet wide antlers, eat 40 pounds of plants a day). In 1992 estimates had the moose population in excess of 3,500 but the total shrank to around 1,700 by 2003, due perhaps the poor nutrition and predation. 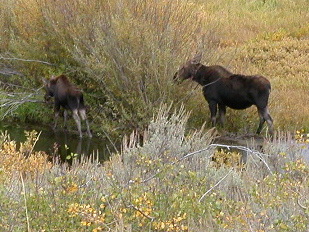 A NPS report said, in 2014, “The Wyoming Game and Fish Department makes an annual winter estimate of herd size based on the number of moose counted in aerial surveys. 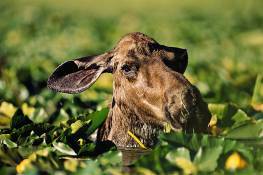 The count for 2014 totaled 241 moose (50 within Grand Teton), producing a Jackson herd estimate of 450 animals. Ratios were estimated at 33 calves and 96 bulls per 100 cows. On warm days moose will seek relief from the heat, at least deeply shady moist spaces. They can’t tolerate temperatures warmer than 55 to 60 degrees and head into the water to cool down when the temps reach 75 to 80 degrees. trumpeter swans (8′ wingspan; mate for life), American white pelicans (their huge yellow beak and throat pouch distinguish them from swans), peregrine falcons (dive at up to 200 mph and strike prey in mid-air), Bald Eagles, deer, beavers and muskrats. We saw 4 to 7 northern river otters while out kayaking in 2002, 2003, 2004 and 2009. One source says they are able to stay underwater for up to eight minutes, another says 2-3 minutes while swimming at 6 miles per hour. Fast humans who can do a 100 meter freestyle in 1 minute are swimming at 3 miles per hour. From a distance it can be hard to tell which small animal you see swimming. But each swims differently. River otters undulate through the water. When a beaver swims, only his head shows above the water, not his tail; muskrats show both their head and part of their back. We might see coyotes and will probably hear them if we are out in the morning or evening. On the 2006 trip we heard wolves early one morning. Coyotes sing in more of a yip, wolves have the deeper howl. Gray wolves were re-introduced into Yellowstone Park in 1995/6 and spread. In 1997 the first wolves were spotted in Grand Teton. In 1999 the first litter of wolf pups in Grand Teton in over 70 years was born. 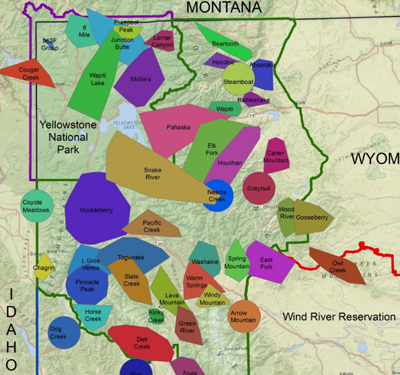 A total of eight wolf packs were believed to have used parts of the Teton Valley in 2006. 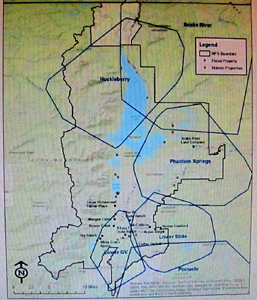 In 2007 four wolf packs had territories that overlapped parts of Grand Teton Park. (Estimates) The Buffalo pack (9 adults, 6 pups) and Huckleberry pack (7 adults, 2 pups) denned in the park. The Teton pack had 3 adults and 5 pups, the Pacific Creek pack had 9 adults and 4 pups. Yellowstone estimated 171 in 2007, 124 in 2008, and 96 to 98 in 2009. In 2008 Grand Teton had 6 packs with 45-50 wolves. In 2010 five packs likely denned in the Jackson Hole area, including Phantom Springs (9 wolves) and Pacific Creek (12-14) packs in northern Grand Teton National Park and Buffalo (14), Antelope (4) and Pinnacle Peaks (4). A park resource page listed a minimum of 59 wolves in 6 packs in the Jackson Hole area and also listed the further south Phantom Springs pack (9). A 2011 U.S. Fish and Wildlife Service Wyoming annual report had more details about Yellowstone packs, but listed 38 known wolf packs in Wyoming with 230 wolves and had a map/listings as of December 2011 with Snake River (7), Huckleberry (6), Pacific Creek (12), Phantom Springs (13), Lower Gros Ventre (3 wolves) packs within Grand Teton park. 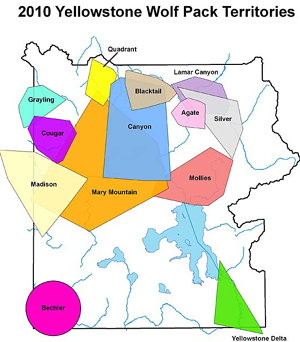 A 2014 map from a Grand Teton National Park webpage showed home ranges of 6 wolfpacks, all of which were both in the park and in surrounding areas. From the north, going south, they were Snake River, Huckleberry, Phantom Springs, Lower Slide, Lower Gros Ventre and Pinnacle. In areas where wolves dominate instead of coyotes, Pronghorn (antelope) fawns are three times more likely to survive, because the wolves favor larger prey. A 2013 newspaper article said there were about 18 mountain lions and an equal number of cubs in the Jackson area. Bears may start digging their winter dens that they will occupy from November +/- (females with cubs earlier than males) until (males) March or (females) April (First bear tracks were reported March 15, 2013, for example.) They will still be foraging for food to put on their needed fat layer to make it through the over half-year winter. From the Smithsonian “Grizzly bears are omnivorous, consuming everything from mosses, fungi, herbs, grasses, fruits, berries, small vertebrates, insects, birds, and fish—especially salmon during their spawning run.” They will be trying to eat 20,000 calories a day; picture yourself eating 35 Big Macs. Grizzlies are seen more frequently in the Tetons than in previous years, and not just up in the high mountains, but occasionally down in the flatlands where we camp or cabin overnight and do most of our sightseeing and kayaking. The odds are will not see any, but you must read your safety in grizzly bear territory. One trip member saw a mom and three young grizzlies on the 2007 trip. Two of us watched a sow for quite awhile on the 2010 trip. In 2007 there were 571 grizzlies (estimate) and in 2010, 602 grizzlies (estimate) in the greater Grand Teton / Yellowstone area, about 10 to 15% collared. A Wyoming Game and Fish department report said in Wyoming in 1982 there were 102 and 469 in 2010. A 2012 park video said there are usually around 100 black bears and 70 grizzlies in the park. to attract or disturb wildlife. For your safety while wildlife viewing, enjoy viewing them from your car, or a safe distance away (25 yards at least for most wildlife, and 100 yards for bears, moose, elk, bison and wolves). 25 yards? picture four car lengths or six kayak lengths, or the width of the De Anza College swimming pool. The trees and shrubs will be leafed out in their new bright green or dark green. Mid June is the fullest flush of wildflower bloom. June is birthing time for many animals. Most of the migrating birds will have moved back into the park and will be building nests, sitting on eggs or hatching eggs. (some nesting started as early as March.) As we remind people on our ocean kayak trips, keep the noise down. Any unnecessary expenditure of energy can harm a feeding or nesting bird or animal. Nesting birds may fly away from the nest exposing unprotected eggs and hatchlings to the sun’s heat or predators. There will be some kinds of baby ducks and they really do swim behind mom in a line and even try to climb up on her back for a ride. Trumpeter swans will have cygnets. The adult Canada Geese we saw flying in “V”s in fall will still be molting and will be flightless. The large hoofed mammals, such as elk, deer, moose, bison and pronghorns, give birth in June and by early July will be letting their babies out of hiding a little more, but they will still be very protective and dangerous. These mammals will have shed their heavy winter coats. By early August most of the bird nesting activity is over. By mid August the Unita ground squirrels go back into their winter burrows for hibernation. What kind of weather should we plan for? We usually have some sunny days warm enough to swim in the lakes. It will probably rain part of the trip and we could even a have a light dusting of snow. In 2007 and 2014 we had a couple of huge thunderstorms. It can be cold at night. 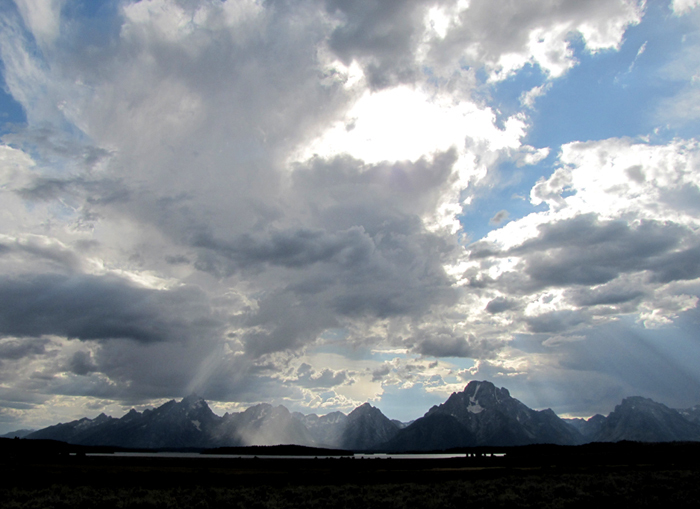 Grand Tetons Weather has the details. You’ll need warm weather gear, including your swim suit, and cold weather gear, especially for early morning paddling and any overnight camping. 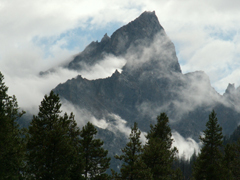 Grand Tetons trip equipment has details and advice based on previous trips. Since different people will have different budgets: drive or fly; some may camp, some may get a hotel room / suite, (most usually get a cheap cabin), the trip cost will vary. St John’s Medical Center hospital in Jackson (24 hour emergency room) is at 625 E. Broadway at Redmond. 1 (307) 739-3301 (please confirm this number when you get there). https://travel.state.gov/content/travel/en/international-travel/International-Travel-Country-Information-Pages/Canada.html#/ and be sure you have proper IDs as needed to go across the border. Grand Tetons September 2004 has pictures from that trip, including two bull moose head-to-head. Be careful when you request info from these as some require that you give them your email address and they will give it out to lots of their advertisers. We found Wyoming public radio with the usual Morning Edition, All Things Considered, BBC Newshour, Fresh Air and late evening classical music or jazz at 90.3 (Jackson) and 91.3 (Dubois). Old Faithfull erupts on an average of every 79 minutes, with a huge jet of hot water up to 204 ° F and up to 180 feet high. The trip is open only to De Anza students/staff. Answers to most questions about how the club works are at: Outdoor Club Basic Info The main rules common to most of our trips, including who is eligible to go, are at: Outdoor Club trip rules. We can expect sunny days and rain, or possibly even a little overnight snow. Interesting weather does not cancel club events. Club activity areas, and all park restrooms or other buildings are non-smoking. Even though there is smoking allowed in Wyoming restaurants, all National Park restaurants, etc. are non-smoking. No alcohol or drug use is allowed during club activities. This is not just a rule written to make the College happy, it is a trip rule. 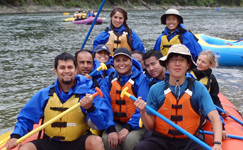 The trip will only be an official club event while we are kayaking (or canoeing), and possibly a hike or some other sightseeing or a group meal at a restaurant. How you get to Grand Teton National Park, where you stay overnight, most meals, most sightseeing, any bike riding, whitewater rafting or horseback riding, going to a movie in town, etc. will not be official club business.